A heavy fall of snow, heaviest währ. Freitag nachm.. Temperatures will be below freezing (maximal -1°C am Freitag morg., min -9°C am Sonntag abend). Winds decreasing (frischer Wind aus SSW am Freitag morg., Windstille ab Freitag abend). A light covering of new snow, mostly falling am Montag morg.. Temperatures will be below freezing (maximal -1°C am Mittwoch nachm., min -9°C am Montag morg.). Wind will be generally light. Die Table oben zeigt die Wettervorhersage für San Cassiano (Alta Badia) auf der angebebene Höhe von 2778 m. Unsere ausgeklügelten Wettermodelle ermöglichen uns die Schnee-Vorhersage für die Gipfel-, Mittel- und Bodenstationen für San Cassiano (Alta Badia). Das Fenster über der Tabelle ermöglicht das Abrufen der Wettervorhersage für andere Höhen. Für einen umfassenderen Blick auf das Wetter, siehe die Wetterkarte" von Italy. Without doubt the best place to ski in the world! 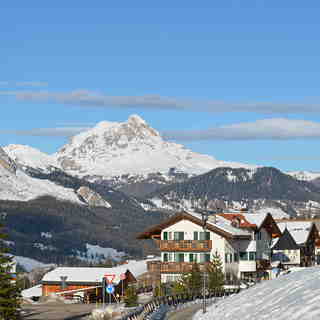 I'm 65 and when in San Cassiano and the Dolomites I ski between 5 and 6 hrs each day for 3-4 weeks each year. We stop for lunch at one of the amazing mountain restaurants (food like mama used to make it....45 mins) and then off again for the afternoon. From 9am - 10am the slopes are empty.....Italians don't start skiing early. Get in for lunch early 11.45am and then you have the first part of the afternoon again with empty slopes. Do bars and spas etc when you've done a good days skiing......then you'll feel you've earned it. This year we skied under blue skies most days.....and although cold.....the snow was so so good!! For the 1st week we hardly skied the same run twice apart from beginning and end of the day......where else can you get skiing like that and with lift passes so fairly priced?? If you have kids, then here you find the most attentive lift attendants....always slowing the lift and helping youngsters onto the chairs. Why am I telling you this? Now everyone will want to go!! 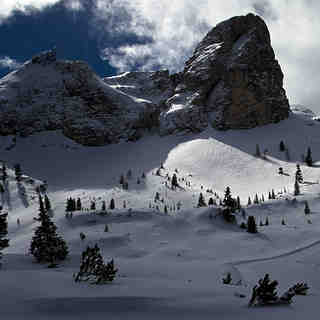 Alta Badia.....the Sella Ronda....the best skiing in the world! !